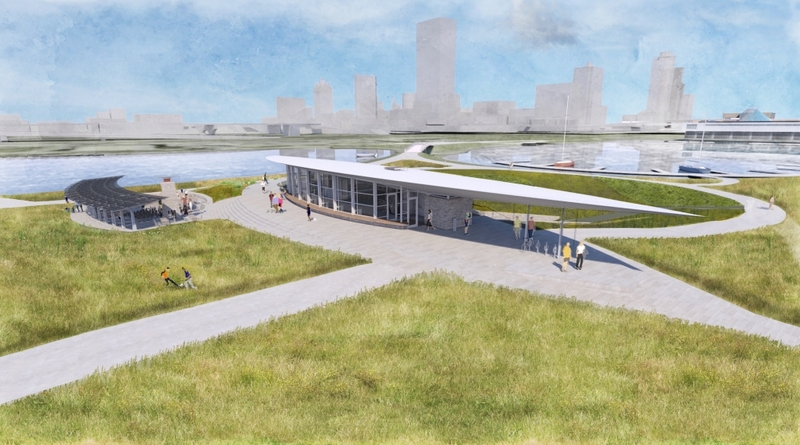 When completed, the Lakeshore State Park Visitor and Education Center will set new standards for sustainability. Visitor and Education Center on Lakeshore State Park. Rendering by The Kubala Washatko Architects, Inc.
Milwaukee, WI – April 15, 2015: In honor of Earth Week and John Muir, “Father of the National Park System” born April 21, 1838, the Friends of Lakeshore State Park Board of Directors invite the public to attend an Open House on Tuesday, April 21 from 4-7pm in the Miller Room at O’Donnell Park, 910 E. Michigan St. for the public introduction of a design study by The Kubala Washatko Architects for a new Visitor and Education Center on Lakeshore State Park. Join the board members to view the design features, discuss the project, and plan for the future. Lakeshore State Park was dedicated in June 2007 as the first and only urban state park in the Wisconsin state park system. This proposed Visitor and Education Center with an Outdoor Plaza will be the gateway to the state parks system. Positioned between downtown Milwaukee and Lake Michigan, the Center will serve as a hub for education and social activities with emphasis on appreciating natural resources, experiencing nature, and learning about environmental stewardship. The Living Building Challenge is an international building certification program created by the International Living Future Institute. More rigorous and wide-ranging than green certification programs such as LEED, the Living Building Challenge is comprised of seven performance categories called Petals: Place, Water, Energy, Health and Happiness, Materials, Equity, and Beauty. When completed, the Lakeshore State Park Visitor and Education Center will set new standards for sustainability. Key project goals include ‘Net Positive’ Energy and Water use, engineered wetland and on-site rainwater harvesting, rigorous adherence to ‘Red-List’ approved and locally-sourced construction materials, along with other innovative requirements such as the integration of ‘urban agriculture’ into the site. The LSP Board of Directors and Friends Group members look forward to your enthusiasm, support, and help in spreading the word to others about the project. By volunteering and making a donation you can help make this dream a reality. The signature bridge in the park can lead to a new Center of ideas and learning opportunities for future generations. This seems like a bit much for the area. The lakefront is so congested at that area with the Art Museum, Discovery World, and Summerfest. The stretch of open prairie with a lagoon is a nice touch for such a busy area. Does it really need some bathrooms disguised as a visitor center? There is a concept being advertised on Milwaukee Public Television: “Milwaukee, a City Built on Water”. The first time I saw the conceptual sketches for this project this same `thought came to mind. Another thought came to mind is provisions for Security. There is a police station at the far North end of the Park. Perhaps this Center could accommodate the South Shore Security Center. Next. I agree that restrooms are needed. I think this is a good design for an unobtrusive structure. It’s so congested there no one will use it? Is that like Yogi Berra, ‘Nobody goes there anymore. It’s too crowded.’ ? I walk or bicycle through the park weekly. Does this very pleasant, well managed artificial landscape really warrant a visitor center? Why disrupt the openness of the relatively small space? The park property is linked with the festival grounds at each end and the gates there are open to pedestrians/bicyclists outside of the festival season. Why not share the cost and location of visitor facilities with a practical structue at either of those gates? @Gary The visitor center has always been apart of the plan for Lakeshore State Park. The lack of a facility has limited the amount of educational services that can be provided, limits the docks use, and makes upkeep more difficult as the DNR works out of Discovery World and stores stuff elsewhere. That very pleasant, well managed artificial landscape is managed by Tom at the DNR and this will improve his ability to manage the park and provide a much wider slate of educational opportunities on the park. Plus a never-ending complaint about the park is that there are no bathrooms. As a former FLSP Board Member I’m happy to see this project moving again… It is a huge undertaking. Glad to see that the first comment matched my reaction–gee, it’s such a nice bit of prairie without any visitor center. Why build it up and make it all formal? It’s a nice refuge from the hustle and bustle and a delightful surprise on a the bike path along the lake. There are other opportunities for bathroom breaks along the bike path without using the island. The building looks pretty unobtrusive and sounds like a cool model for sustainable design. The need for restrooms is real, Anglers set up on the south end near the Hank Aaron Trail. Bicyclists come off trail and can use a break. Isn’t the closest restroom site at Discovery World, a fair hike, and not open past business hours? And boaters restroom needs are also crucial. There may be other places to stop for riders but for strollers it can be an eternity. The center will also be welcoming with warmth in winter and cool shade in summer. I vote for comfort for all! Wait a second…Does Scott Walker know about this? Surely the State of WI cannot possibly be involved in a project that — even if paid for by outside money up front — will run up future costs for maintenance. Especially for something that also only benefits such a small portion of the population like boaters and anglers.